Higher National Qualifications provide practical skills and theoretical knowledge that meet the needs of employers. The Higher National Certificate (HNC) in Sound Production (SCQF level 7) develops knowledge and skills in sound production and related technological disciplines. The Higher National Diploma (HND) in Sound Production (SCQF level 8) builds on the knowledge and skills of the HNC to cover the development of proficiency in the creative use of sound production technology and applications. 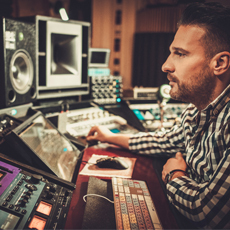 This qualification covers areas such as key sound production skills, techniques and standards, critical listening skills, creative listening skills, and the practical and creative application of these skills and knowledge areas across a range of sound production contexts. This qualification is available through colleges, training providers, and some universities. Typically, an HNC takes one year to complete and an HND takes two years. Online webinar sessions help teachers and lecturers develop their understanding of the new Higher National Music, Music Business and Sound Production frameworks to be implemented from session 2018/19. Higher National Qualifications have been developed by SQA in partnership with colleges, universities, and industry — so employers recognise that they provide sound evidence of ability. There is a wide choice of optional units which will enable centres to offer courses tailored to meet learners’ needs. These Higher National Qualifications provide progression routes to further study (see Progression). The Higher National Qualifications are designed for those interested in pursuing a career in sound production and who wish to develop the knowledge, creative, and technical skills required. The HNC and HND in Sound Production are designed to be of value to learners who hope to progress to employment or further study. Learners who achieve an HNC in Sound Production can progress to the HND in Sound Production, to the first or second year of a relevant university degree, further study, or to employment (eg in sound engineering). Assessments are largely practice based, giving learners grounding in key technical, creative, and organisational aspects of the sound production industries. The units are designed to prepare learners for a variety of roles within the sound production industries and to prepare for progression to further study. The HNC in Sound Production at SCQF level 7 consists of 6 mandatory units (80 SCQF credit points) and a number of optional units (16 SCQF credit points). The HND in Sound Production at SCQF level 8 consists of 11 mandatory units (240 SCQF credit points) and a number of optional units (80 SCQF points). These Group Awards have been replaced and entered into their lapsing period. the Group Award Arrangement document will remain until the qualification reaches its finish date at which point it will be removed form SQA website and archived. no new centres may be approved to offer the Group Award. Centres should only enter candidates whom they expect to complete the Group Award during the defined lapsing period of 3 years (HNC) and 4 years (HND). Return to HN Creative Industries subject page.